The Forest School is an educational and research facility that specializes in the Atlantic Rainforest biome. Since 2012, it has offered several courses that focus on environmental conservation and forest economics, and it has helped to disseminate the sustainability movement in Southern Bahia. The training is offered free of charge to interested parties. The primary audience is community leaders, researchers, university students, the public elementary school network and residents of the region. Among the courses offered are: Agroecology, Bioconstruction, Sustainable Civil Construction, Ecotourism, Woodworking, Forest rangers and Permaculture. Bio-construction, a.k.a sustainable or low-impact construction, is an arm of permaculture. It is really an alternative conception civil construction with respect to humans and the environment. It uses nearby materials that do not damage the environment. It is a way of thinking about a set of actions, capable of providing well-being, beauty, comfort and security.For IFV, our greatest concern was in relation to water treatment, which I consider the most valuable resource we have on planet Earth. We observed a whole cycle involving rain collection, in which we internally reused the water as many times as possible, until the evaporation stage. In order to increase attendance capacity the Forest School has expanded its facilities using bio-construction techniques . 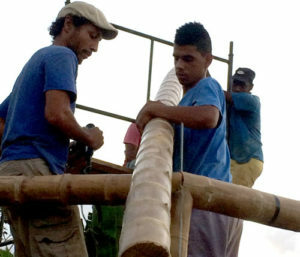 The work itself was part of the Low Impact Civil Construction course, which brought together the main construction leaders in Serra Grande, Uruçuca and Itacaré. Participants learned how to collectively build this kind of “green” roofing for one of the classrooms. The auditorium has already been constructed from recycled glass and bamboo. From 2017 on, through a partnership with Yale University (USA), the Forest School curricula are being reviewed and improved. IFV has also become the Brazilian base of the Yale Environmental Leadership Training Initiative (ELTI), an international reference center for empowering rural leaders to preserve the environment.